While I don’t necessarily agree with the September 2016 assessment that it “looks like e-books were merely a passing fad,” by Good E-Reader’s Michael Kozlowski, it is true that the Association of American Publishers (AAP) reported a 14% decrease in ebook sales from 2014 to 2015 for trade publishers. While Kozlowski goes on to elaborate that “our love affair with e-books [has] started to wane” due in part to high prices, I don’t think ebooks are going away anytime soon. The Digital Reader’s Nate Hoffelder writes, “Stats from the AAP show that some publishers are seeing a decline in ebook sales, but when it comes to usage in libraries the news is very different”: In 2016, readers borrowed 21% more ebooks from OverDrive than they did in 2015. So, on the surface, readers are buying less and borrowing more—and yet Amazon, Barnes & Noble, and Kobo (now Rakuten Kobo, Inc.) continue to release new e-readers and put effort into selling ebooks. Let’s look at the press releases each company has provided this past year to take the temperature of their ebook programs. In the News: On April 13, Amazon launched the Kindle Oasis (see image), its thinnest (at an average of 30% thinner than other Kindles) and lightest (weighing 4.6 ounces) e-reader to date. 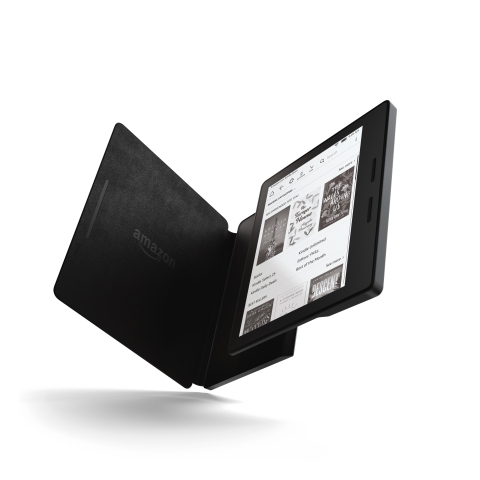 This eighth-generation Kindle features an ergonomic grip that moves its center of gravity to the reader’s palm, meaning customers can read comfortably for hours. Pages are turned using the touch display or physical buttons. It also has the longest battery life of any Kindle (“months” is as much detail as the press release mentions) and comes with a removable leather cover with a built-in charger and three colors to choose from (black, merlot, or walnut). At launch, it cost $289.99. On April 21, Amazon announced additional storage for its Fire and Fire Kids Edition tablets. Customers now have the option to purchase a tablet with 8GB ($49.99) or 16GB ($69.99; $119.99 for the Fire Kids Edition) of internal storage. In addition, Fire now comes in magenta, blue, tangerine, or the original black. On June 22, Amazon updated its original Kindle, making it thinner and lighter and adding twice the memory of its previous version as well as black and white color options (see a pattern?) while keeping its price point of $79.99. It is also more rounded, making it more comfortable to hold. Thanks to a software update, readers can now export their notes and highlights from within ebooks to their email. Among other enhancements, this version became the first Kindle product to add built-in Bluetooth audio support so visually impaired readers can use the VoiceView screen reader without an adaptor. Instead, they can use their own Bluetooth-enabled headphones or speakers. On June 28, Amazon introduced a free feature to its Kindle program, Page Flip, which helps readers navigate through their ebooks while saving their last-read place. They can flip back and forth between pages; zoom out to a bird’s-eye view of a book; view pages, highlights, pictures, and other elements at a glance; and have their place saved on the side of the screen to return to when ready. This update makes Amazon’s ebook-reading experience more similar to how people approach print books, showing how well Amazon understands its customers and caters to their needs. On July 19, Amazon expanded its Kindle Singles program (featuring works that are 5,000–30,000 words long) with the launch of Singles Classics: 140-plus articles, essays, and stories from magazines and periodicals that are written by “iconic” authors such as John le Carré, Kurt Vonnegut, Norman Mailer, and Gloria Steinem. Free for Kindle Unlimited members and 99 cents for other Kindle, Fire, and Kindle app users, some of this content is in digital form for the first time. On Sept. 8, Amazon released the newest Amazon Fire HD 8, which has an 8-inch display, front- and rear-facing cameras, and up to 12 hours of battery life, as well as 50% more RAM and twice the storage capacity (up to 32GB, plus 200GB of extra storage from a microSD card) of previous Fire tablets. It is the first of Amazon’s tablets to come with Alexa, Amazon’s virtual assistant, and it cost $89.99 at launch. The color options are black, magenta, blue, or tangerine. On Oct. 5, Amazon launched Prime Reading, which allows U.S. Amazon Prime members to read as many ebooks, magazines, comics, Kindle Singles, and other content as they’d like at no additional cost. They can read on Kindle or Fire devices or on the Kindle app.